Actor Liam Neeson stopped by Jimmy Kimmel Live! last night to promote his latest film Run All Night, in which he co-stars with Ed Harris, Joel Kinnaman and Common. While there, the action star attempted to help parents put their children to sleep by reading them a bedtime story but ended up getting pretty angry while doing it. Check it out, below. As you probably saw for yourself the moment the above clip began, this was to be “no ordinary bedtime story.” All was going well, until the mother continually called the doctor and the doctor said “no more monkeys jumping on the bed.” It was one of these moments that seemingly set Neeson off, forcing him out of aggravation to summarize the rest of the book. He even instructs the audience to “listen very carefully” prior to delivering the rest of the story, just like he's speaking to a villain in one of his Taken films. So was his straight face while complaining that the mother called a doctor rather than a vet. One look in those stone cold eyes and you know the man is not to be trifled with--even while reading a children's book. His final comment that the woman is sick and should be “committed to a mental institution” prior to slamming the book shut, saying “the end,” was absolutely priceless. What's great about watching Neeson perform is you know he's going to go dark and snap (because that's what his character always does these days) but you never know exactly when the moment will arrive. It's that moment we're all waiting for and, knowing that, the comedic/dramatic actor takes his time before giving it up. When he finally does deliver the moment, it works without fail every single time... as it did in the above bedtime story segment. The beauty of Neeson's above performance (and any of his performances, for that matter) is the fact even after giving us the “no more monkeys jumping on the bed” moment, we're still entertained. His decision to stop reading due to the story taking too long and rather to paraphrase it in full Neeson fashion was exactly what he's trained us to want and expect. “Listen very carefully,” he says prior to breaking it down for fans...err... weary children, in a timely manner. It's like watching a two-minute version of one of his many action films. Neeson is a pro at running the late show circuit. It's as if he's got it down to a science. Remember when he stopped by The Tonight Show back in January and got into that very intense arm wrestling match, where he tried to intimidate Jimmy Fallon into submitting, telling him he's going to “find a hundred Jimmy Fallon look-alikes, put them in a room together and show you the world's creepiest surprise party.” It's that kind of material that has allowed the action star to make a name for himself. 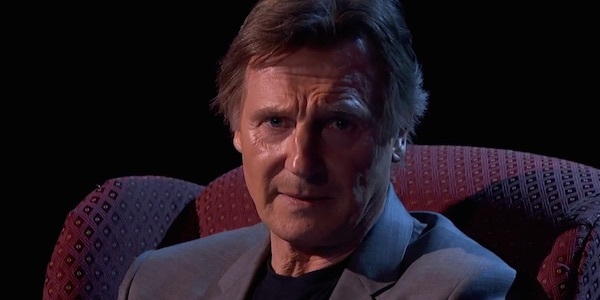 Prior to these latest two appearances, the Taken 3 actor also shared a really ridiculous found footage clip of his first film with Fallon as well as obliged a creepy fan's desire to be threatened on Jimmy Kimmel Live!. He also took part in a hysterical Taken 4 trailer with Kimmel's good friend Guillermo Rodriguez. Watch more clips of Neeson's latest appearance on Jimmy Kimmel Live! over at ABC and catch future episodes of the show, airing weeknights at 11:35 EST.